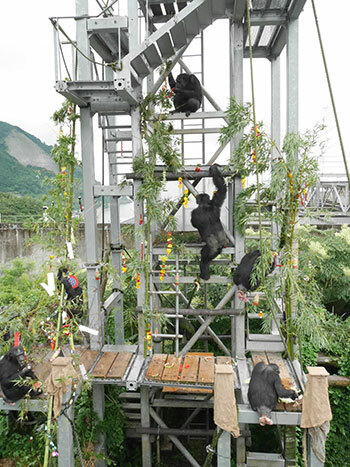 On July 7th, a week shy of the first ever World Chimpanzee Day, we held a themed celebration at Kumamoto Sanctuary, the first and only sanctuary for chimpanzees in Japan. Why the 7th? 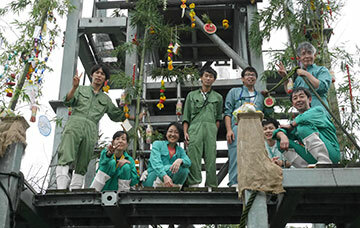 Because it was "Tanabata", also known as the star festival (besides, we were too excited to sit tight one more week)! "Tanabata" is a Japanese festival held each year on the seventh day of the seventh month, originating from the Chinese Qixi Festival. 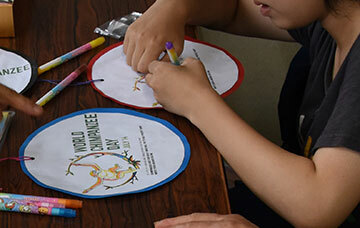 Japanese people traditionally celebrate "Tanabata" by writing wishes on long strips of colorful paper (tanzaku) and hanging them on bamboo trees. We didn&apos;t want to miss this perfect opportunity to share our foremost wishes. Ever since Dr. Jane Goodall first began to study wild chimpanzees in Gombe, Tanzania on July 14th, 1960, she has been an incredible source of inspiration to us and people all around the world. Her pioneering breakthroughs showed that chimpanzees and humans are much more similar than what had been previously thought. Researchers who follow in Dr. Jane&apos;s footsteps continue to add to this growing body of evidence, and we are grateful that our studies can also contribute to this. The more closely we study chimpanzees, the more we are able to realize that humans are not as special or unique as once believed. We now have the responsibility to protect our closest cousins in the animal kingdom. 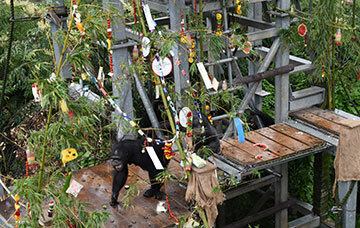 We crafted special bamboo trees together with an amazing partner, a nonprofit organization called the Sanctuary Project, which is run by people dedicated to ensuring the proper lifelong care of all chimpanzees in Japan. 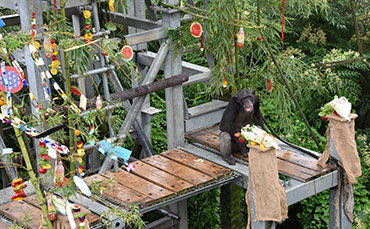 We enhanced outdoor enclosures with fresh bamboo trees garnished with seasonal fruits and vegetables. 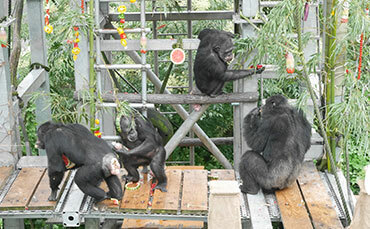 By adding pieces of fruit to the upper part of the three-dimensional climbing structures, it enabled us to increase the chimpanzee&apos;s gathering and foraging time. The mixture of verdant green shoots and glistening multicolored fruits also provided a nice visual contrast. 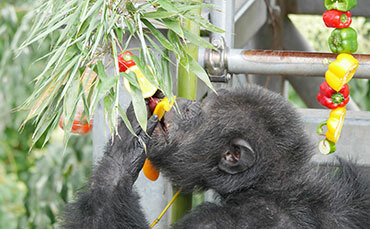 Just like individuals in the wild, our chimpanzees were able to pick and choose their favorites from a variety of items, and they really seemed to enjoy themselves while doing so! We are incredibly grateful to have had an opportunity to promote the care of chimpanzees in captivity and will continue to support and encourage the protection and conservation of chimpanzees in both the wild and captivity. Our wish is that you will also celebrate World Chimpanzee Day by taking part in this beautiful movement to ensure a secure and hopeful future for all chimpanzees living throughout the world. That&apos;s the kind of world we want to live in, the world we want our children to live in, and so it&apos;s our responsibility to make a positive difference. In honor of humankind’s closest cousin, World Chimpanzee Day is a celebration of chimpanzees and an opportunity to raise awareness about the vital need for worldwide participation in their care, protection, and conservation in the wild and in captivity as an endangered species. 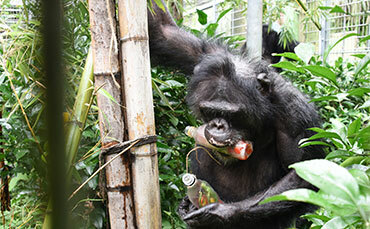 The goals of World Chimpanzee Day are to celebrate our closest living great ape relative in the animal kingdom; raise awareness about threats they face in the wild including habitat loss, disease, and wildlife trafficking; and to promote their proper care in captive situations. 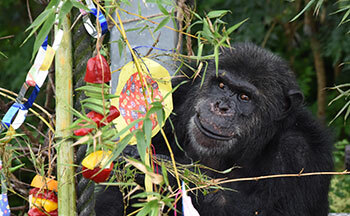 To learn more about World Chimpanzee Day and get involved, please visit worldchimpanzeeday.org.